This article is about the Swiss physicist. For the man accused of espionage, see Felix Bloch (diplomatic officer). Felix Bloch (23 October 1905 – 10 September 1983) was a Swiss-American physicist and Nobel physics laureate who worked mainly in the U.S. He and Edward Mills Purcell were awarded the 1952 Nobel Prize for Physics for "their development of new ways and methods for nuclear magnetic precision measurements." In 1954–1955, he served for one year as the first Director-General of CERN. 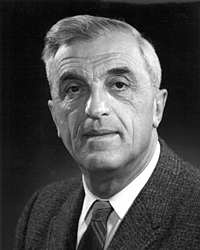 Felix Bloch made fundamental theoretical contributions to the understanding of electron behavior in crystal lattices, ferromagnetism, and nuclear magnetic resonance. Bloch was born in Zürich, Switzerland to Jewish parents Gustav and Agnes Bloch. He was educated at the Cantonal Gymnasium in Zürich and at the Eidgenössische Technische Hochschule (ETHZ), also in Zürich. Initially studying engineering he soon changed to physics. During this time he attended lectures and seminars given by Peter Debye and Hermann Weyl at ETH Zürich and Erwin Schrödinger at the neighboring University of Zürich. A fellow student in these seminars was John von Neumann. Bloch graduated in 1927, and was encouraged by Debye to go to Leipzig to study with Werner Heisenberg. Bloch became Heisenberg's first graduate student, and gained his doctorate in 1928. His doctoral thesis established the quantum theory of solids, using Bloch waves to describe electrons in periodic lattices. He remained in European academia, working on superconductivity with Wolfgang Pauli in Zürich; with Hans Kramers and Adriaan Fokker in Holland; with Heisenberg on ferromagnetism, where he developed a description of boundaries between magnetic domains, now known as "Bloch walls"; with Niels Bohr in Copenhagen, where he worked on a theoretical description of the stopping of charged particles traveling through matter; and with Enrico Fermi in Rome. In 1932, Bloch returned to Leipzig to assume a position as "Privatdozent" (lecturer). In 1933, immediately after Hitler came to power, he left Germany because he was Jewish, returning to Zürich, before traveling to Paris to lecture at the Institut Henri Poincaré. In 1934, the chairman of Stanford Physics invited Bloch to join the faculty. Bloch accepted the offer and emigrated to the United States. In the fall of 1938, Bloch began working with the 37 inch cyclotron at the University of California at Berkeley to determine the magnetic moment of the neutron. Bloch went on to become the first professor for theoretical physics at Stanford. In 1939, he became a naturalized citizen of the United States. On March 14, 1940, Bloch married Lore Clara Misch (1911–1996), a fellow physicist working on X-ray crystallography, whom he had met at an American Physical Society meeting. They had four children, twins George Jacob Bloch and Daniel Arthur Bloch (born January 15, 1941), son Frank Samuel Bloch (born January 16, 1945), and daughter Ruth Hedy Bloch Alexander (born September 15, 1949). During WWII, Bloch briefly worked on the atomic bomb project at Los Alamos. Disliking the military atmosphere of the laboratory and uninterested in the theoretical work there, Bloch left to join the radar project at Harvard University. After the war, he concentrated on investigations into nuclear induction and nuclear magnetic resonance, which are the underlying principles of MRI. In 1946 he proposed the Bloch equations which determine the time evolution of nuclear magnetization. Along with Edward Purcell, Bloch was awarded the 1952 Nobel Prize in Physics for his work on nuclear magnetic induction. When CERN was being set up in the early 1950s, its founders were searching for someone of the stature and international prestige to head the fledgling international laboratory, and in 1954 Professor Bloch became CERN's first Director-General, at the time when construction was getting under way on the present Meyrin site and plans for the first machines were being drawn up. After leaving CERN, he returned to Stanford University, where he in 1961 was made Max Stein Professor of Physics. At Stanford, he was the advisor of Carson D. Jeffries, who became a professor of Physics at the University of California, Berkeley. In 1964, he was elected a foreign member of the Royal Netherlands Academy of Arts and Sciences. Bloch died in Zürich in 1983. ^ Hofstadter, Robert (March 1984). "Obituary: Felix Bloch". Physics Today. 37 (3): 115–116. Bibcode:1984PhT....37c.115H. doi:10.1063/1.2916128. Archived from the original on 30 September 2013. ^ Sohlman, M (Ed.) Nobel Foundation directory 2003. Vastervik, Sweden: AB CO Ekblad; 2003. ^ Fraser, Gordon (2012). "Chapter 7". The Quantum Exodus. Oxford University Press. p. 182. ISBN 978-0-19-959215-9. ^ a b c d e f Hofstadter, Robert; Chodorow, Marvin; Schawlow, Arthur; Walecka, Dirk. ""Memorial Resolution: Felix Bloch (1905 - 1983)"" (PDF). Archived from the original (PDF) on 11 March 2017. Retrieved 11 November 2017. ^ "Bloch, Felix", Current Biography, H. W. Wilson Company, 1954. Accessed 24 February 2013. "Because of his Jewish faith, his position soon became uncomfortable and he went to Paris, where he lectured at the Institut Henri Poincaré." ^ Charles, Weiner (15 August 1968). ""Oral Histories: Felix Bloch"". American Institute of Physics. Retrieved 11 November 2017. ^ Bloch, F.; Hansen, W. W.; Packard, Martin (1 February 1946). "Nuclear Induction". Physical Review. 69: 127. Bibcode:1946PhRv...69..127B. doi:10.1103/PhysRev.69.127. ^ Shampo, M A; Kyle R A (September 1995). "Felix Bloch—developer of magnetic resonance imaging". Mayo Clin. Proc. 70 (9): 889. doi:10.4065/70.9.889. PMID 7643644. ^ "People and things : Felix Bloch". CERN Courier. CERN. Retrieved 1 September 2015. ^ "F. Bloch (1905 - 1983)". Royal Netherlands Academy of Arts and Sciences. Retrieved 22 May 2016. "Nobel Prize for Physics, 1952". Nature. 170 (4335): 911–912. 1952. Bibcode:1952Natur.170R.911.. doi:10.1038/170911b0. "Deputy Director-General: Prof. E. Amaldi". Nature. 174 (4434): 774–775. 1954. Bibcode:1954Natur.174R.774.. doi:10.1038/174774c0. McGraw-Hill Modern Men of Science. 1. McGraw-Hill. 1966. pp. 45–46. ISBN 978-0-07-045217-6. National Cyclopaedia of American Biography. 61. James T. White & Co. 1984. pp. 310–312. ISBN 0-88371-040-4. Bloch, F.; Staub, H. "Fission Spectrum", Los Alamos National Laboratory (LANL) (through predecessor agency Los Alamos Scientific Lab), United States Department of Energy (through predecessor agency the US Atomic Energy Commission), (August 18, 1943).